Kura Koiwi: Bone Treasures, by Brian Flintoff (Craig Potton, Nelson, 2011), 160 pp., $39.95. 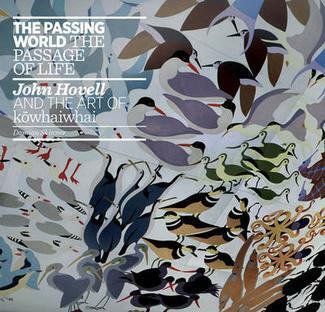 The Passing World: The Passage of Life: John Hovell and the Art of Kōwhaiwhai, by Damian Skinner (Rim Books/Huia Publishers, 2010), 136 pp., $49.99. The cover of Kura Koiwi depicts the taongā kōrero (personal pendant) carved for the kaumātua Sir Tipene O’Regan out of a big whale tooth, using a design based on the traditional symbol of Murihiku — the southernmost part of the South island — which is a whale’s tail. The bottom half of the carving incorporates the head of the whale, an acknowledged tribal guardian or taniwha. Brian Flintoff is a self-taught Pākehā master bone carver who grew up in Southland and now lives in the Nelson region. Kura Koiwi brings together examples of his bone carvings as a follow-up to Taongā Pūoro: Singing Treasures (2003), which contained examples of traditional Māori musical instruments carved by Flintoff and played by musicians Hirini Melbourne and Richard Nunns on their classic recording Te Ku Te Whe, which came out on Rattle Records in 1994. With its whirrings, clicks, and solitary mournful flutes, this CD evoked elemental sounds of Aotearoa that derive not only from birdsong, but also from notes sounded by humpback whales, the fluttering of moths, clicking noises of insects and the rustlings of the wind. Traditional Māori had families of musical instruments, and Nunns, having amassed an original collection of some dozens of these taongā pūoro, offered them as templates for Flintoff to make new versions. Flintoff began by making paua shell jewellery in 1977, but even as a child he’d been fascinated by bone carving, and the shift towards learning the codified designs of Māori tikanga (or customary art) was a logical consequence of his obsession with haptic objects – that is, organic forms shaped and crafted by hand. As he tells us: ‘Māori art predominantly stylised things that were being portrayed (and) stylisations were often done as profiles, focusing on the most important elements. These stylised elements were then reassembled to fit a design shape . . . some elements not essential to the design shape could be omitted’. The metaphor of intercoiled forms implying a transfer of strength to the wearer is characteristic of bone carvings that are intended to be worn; the twists or crossovers, spirals or hooks, imply with their flowing curves that each part, both functional and decorative, helps sustain each other part. What at first glance may seem merely a curio, or curiosity piece, will be linked to the Māori world view by the stories it contains. The bone fish hooks or hei matau worn as pendants refer to legends. The barb may be the stylisation of the tail of a makau shark, symbolically summoning the energies of that creature, while the top, where it ties to the line, is enlarged to the shape of a stylised head. Flintoff retells the legend of Maui, who used the jawbone of his grandmother to bring a massive fish to the surface. This fish, Te Ika a Maui, became the North Island. His brothers, jealous of his success, ran around spearing and cutting it, so that its smooth skin became undulated and rough, creating ravines and mountains. But if Flintoff appears to be recycling snippets of a quaint mythology, fit for purpose, his artefacts also generate a visual magic all their own. He shows us castanets, bullroarers and flutes he has carved from a whale’s earbone, an albatross wingbone, a pilot whale jawbone, a moa’s legbone. Elsewhere the punched-out bone is a tad less rarefied; he carves tuatara from warthog tusks, a sea horse from a dolphin vertebra, a stingray from a whale vertebra. By implication bone is precious, a way of evoking a single polymorphous life-force. Flintoff’s book establishes bone carving as a primal and universalist art form, with examples of Canadian moose-bone carvings of orca whales, a deer antler carving of lizards from Thailand, a miniature Christ carved out of elephant ivory in Notre Dame Cathedral, a netsuke carving of a life-like fly on a piece of horn carved from the tusk of an ice-age woolly mammoth. Hatched out of bone, this bestiary, still conjoined to the rigid dead tissue, the matrix, from which it was made, seems profoundly shamanistic in its evocations of connections with cosmic circuits of time, and is thus redeemed from suggestions of the kitsch and the commercial through the carver’s decorative strategies that rework the truths of the human condition. Māori creation myths also drive the art of John Hovell, as discussed in Damian Skinner’s monograph on Hovell’s work, The Passing World: The Passage of Life: John Hovell and the Art of Kōwhaiwhai, only here the art form that is primarily explored is the kōwhaiwhai — or Māori painting associated with carved meeting houses (whare whakairo) on marae. Damian Skinner has established himself as a Pākehā historian who has championed the need to include ‘the Maori side’ in the story of modern art in New Zealand. That is, he offers a critical reappraisal of the local version of Modernism. Having published monographs of two Pākehā high modernists — Don Binney and Michael Illingworth — Skinner turned to the stresses and tensions between modernist art and customary Māori art (tikanga), and the resolutions of these tensions that some artists arrived at, in his books The Carver and the Artist: Māori Art in the Twentieth Century(2008), and Ihenga — Te Haerenga Hou: The Evolution of Māori Carving in the Twentieth Century (2007), the latter co-authored with Māori carver Lyonel Grant. The generation of Māori artists who emerged in the 1950s (the Gordon Tovey generation, trained in Modernist principles of art at teachers’ training colleges under the direction of educator Tovey) were all fired up about twentieth century abstraction, which derived indirectly from Pablo Picasso, Henry Moore and Surrealism and other art movements, from primitive African and Oceanic art. However, Modernism also promoted the cult of personality and notions of ‘originality’, of breaking with the past, which were antagonistic to the communal imperatives of traditional carvers, who were encouraged by their tribes to make customary art for meeting houses, churches and clubrooms. The narrative that Skinner’s series of books traces is one that shows how Māori artists, such as Cliff Whiting, Sandy Adsett, Arnold Maanaki Wilson, Fred Graham, Buck Nin, Selwyn Muru, Paratene Matchitt, John Hovell and others, found a way of creating art for their community which also honoured their commitment to the aesthetics of Modernism. The story is complicated by the particular vision of Sir Apirana Ngata, the Māori leader dedicated to preserving the best of traditional Māori arts and crafts through asserting the importance of art made on the marae by carvers and artists who had trained at the Rotorua School of Māori Arts and Crafts, or else been taught by those who had trained there. As Skinner has pointed out: in Māoritanga a piece of whakairo (wood carving) gained mana and meaning through being part of the whare whakairo (decorated meeting house), with its allusions to whakapapa (genealogy). It needed to be a work about tupuna (ancestors) and the heritage of the past. Likewise, kōwhaiwhai, or rafter painting, was meant to embellish the ‘carved wooden box’ of the whare whakairo. Defended by traditionalists, such as the leading master carver (tohunga whakairo) Pineamine Taiapa, tikanga as practised on the marae was initially rejected by the new wave of urban-based Maori artists — notably Ralph Hotere — and the gradual process of blending or fusing two seemingly contradictory world views is related by Skinner in his account of the career of John Hovell. Born into a Ngāti Porou family at Whitianga on the Coromandel in 1937, and just old enough to belong to the emergent Māori Modernist generation, John Hovell grew up on a farm, then graduated with a BA in English from the University of Auckland. After attending Auckland Teachers’ College, he returned to work on the Coromandel, where he became associated with a circle of artists that included Paratene Matchitt, a prime mentor for him, and Michael Illingworth. An artist of the coast, Hovell produced paintings in the 1960s and 1970s that drew on notions of organic growth, on stands of native forest as well as on the fecund garden soils of the semi-tropical Coromandel, and which were sold in dealer galleries. He offered thorny-looking vegetation that supported ripening pods, bulging gourd shapes, and was framed by landscapes reddened by the sun. His kumara- and potato-like tubers bulged in khaki and gold, olive green and purple, through the clays and ochres of the earth, to promote a utopian atmosphere, an agricultural paradise. At the same time, at the suggestion of Paratene Matchitt he began to take lessons in kōwhaiwhai motifs from the carver Pineamine Taiapa, who was also of Ngāti Porou, moving in 1967 to Te Araroa on the East Coast, where Taiapa lived. And Hovel was becoming increasingly politicised, part of the Māori Renaissance of the 1970s which produced organisations such as Tame Iti’s Nga Tamatoa, the Waitangi Action Committee, along with the Maori artists and writers organisation Nga Puna Waihanga, for which Hovell acted as secretary in the early 1980s under the presidency of Paratene Matchitt. Hovell continued working as a teacher and making paintings, often quirky surrealistic transformations such as the one in which strange cityscapes are shown hatching out of gourds, while a flock of shining cuckoos (the pīpīwharauroa) flap overhead, each looking like a kind of globe-girdling Concorde airliner (‘Cuckoo leaving the gardens at the end of summer’, 1977). Damian Skinner charts Hovell’s moves over the years to different teaching positions around the North island, and also his relocation in 1988 to the Solomon Islands, where he lived for twenty years teaching art while also serving as an Anglican minister. But Skinner’s main objective is to establish Hovell as representative of the cultural shift which energised art within Māori communities in rural areas as the artist became increasingly involved with restoration projects for wharenui whakairo, as well as other communal spaces. Hovell’s special contribution to kōwhaiwhai painting has been offering dynamic reinterpretations of standard motifs. On what Skinner terms Hovell’s ‘masterwork’ — the ceiling panels the artist designed and painted for Raikairoa, a whare whakairo on Harataunga Marae at Kennedy’s Bay — the Māori historian Ranginui Walker has written: ‘the result is a stunning integrated piece of artwork in delicate colours of earth, sky and sea, depicting trees, ferns, plants, insects, lizards, native forest birds, fish, rays, eels, sharks, shellfish, crayfish and birds.’ In Hovell’s colour schema, blue shades belong to the realm of Tangaroa and the sea, green shades to the realm of Tane and the forest. Teeming and bountiful, Hovell’s imagery, whether painted on the ceiling of a school dining hall or the walls of a town’s council chambers, celebrates whale roads and crayfish alleyways, the frictionless slipperiness of wave-riding kaimoana, the whole breadth of creation rising in a cinematic flood across the sky, forming rainbow arcs that evoke a holistic kinship with the soul of the land, a vision of manawhenua, a Māori universe that Sir Apirana Ngata would recognise and surely approve of. Complemented by the nuanced and panoramic colour photographs of Haruhiko Sameshima, this latest instalment of Damian Skinner’s ongoing reassessment of the place of Māoritanga in New Zealand art is a major work of rehabilitation and recognition.